There is a good network of rights of way around Cheddington. see map below or download a full-size PDF version by clicking the link on the right. The Parish Council is a member of the Buckinghamshire Parish Paths Partnership and volunteer footpath wardens monitor the state of footpaths and bridleways to ensure that they are well maintained. 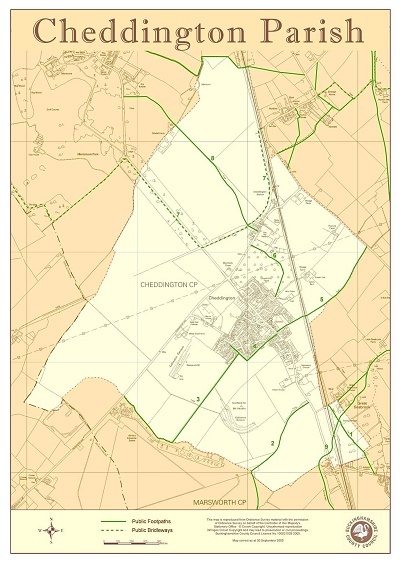 Map produced by Buckinghamshire County Council under licence from the Ordnance Survey. Unauthorised reproduction infringes Crown copyright.